Grooming is one of the most important parts of your day- for any man. And the beard contributes to a major slice of the pie of mens grooming. The most important tool in the male arsenal for grooming is the Trimmer. Nowadays, there are a lot of brands out there selling various types of trimmers that is mind-boggling. Choosing the right trimmer is no less than a strategic war. But don’t worry, this review shall try to save the day by informing you about an awesome mens grooming product by a well-known brand. 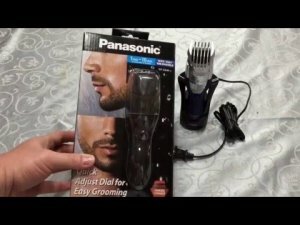 The Panasonic ER-GB40 Hair and Beard Trimmer is a brilliant device for professional grade grooming. The Trimmer is fully immersible in water which means that any accidental drops into the water wouldn’t damage the device. Secondly, it comes with the Sharp 45 degree stainless steel blades which are extremely durable and ensure fine and clean trim. The blades also make sure it doesn’t hurt or cause any type of irritation while trimming. This puppy is fixed with the Quick Adjust Dial featuring 19 Precision Length Settings for both hair and beard which open your way to getting tons of dazzling styles right at your home. It comes with an ergonomic design with rubberized grip for stress free trimming. The Panasonic ER-GB40 Hair and Beard Trimmer houses a handy cleaning hole which allows water to flow freely through the head of the trimmer thus helping in removing the residual foam and hair from the blades. Hence, this puppy is very easy to clean and maintain which is a must have quality for any device. Finally, it supports wireless charging which means that it needs to be on the charging stand for 15 hours to give you a trimming time of 50 minutes. Although this is a great feature, but it prevents the user from using the trimmer while charging which is possible in all the trimmers with wired charging which is perhaps the only let down of this device. The Trimmer is fully immersible in water. Quick Adjust Dial featuring 19 Different Length options for more versatility. Suitable for both Dry and Wet Operation. The Handy Cleaning Hole on the head of the trimmer for easy cleaning and maintenance. No trimming support while charging as the trimmer needs to be on the charging stand for charging. Batteries are not up to the mark. Finally, I would like to say that this trimmer brings on some really cool features which are difficult to find in this price range. This is a fabulous device with the only minus being the really long charging time and no trimming support while charging. So if the charging time is not an issue for you, then you can definitely go for this trimmer and you can check this out on Amazon. Let me know what you think about this product down in the comments section and also tell us whether you liked this review or not. A very ergonomic and reasonably capable trimmer. We especially liked the look and the insta adjustable depth which gives millimeters depth not a grade- this can give you an in-between look. It does the trimming job quite well and a charge will last for a decent enough time maybe enough to travel for a week depending on how much you need it. I need only a single trim in a week- it could do 2. The charger may not be suitable for use abroad so check the voltage or try and make the most out of a charge before you go. Note this is a trimmer and adequate and there is a bit of pulling which I have found with most. This will be a good choice for many of you readers but if you are wanting something a bit meaty then you might look at something more expensive and industrial.